Refining Fire by Tracie Peterson is Book Two in the Brides of Seattle series and the first of Ms. Peterson’s books that I’ve had the pleasure of reading. I was able to follow the storyline even though I hadn’t read the first book in the series. It’s an historical fiction novel set in 1889, Seattle, Washington. There are several wonderful characters in this book but one of my favorites is Abrianna Cunningham. Abrianna is light years ahead of her time with her outspoken and independent spirit. She says what’s on her mind without pause to the acceptable societal norms. She does so with vivaciousness and attitude. She’s hilarious at times but she’s also the champion every wounded soul would want in their corner. Abrianna is out to change the world and with her three closest friends, whom she drags alongside her, she is making great strides to do just that. When a pompous preacher comes to town he tries to put her in her place but Abrianna is too strong a woman for that. Militine Scott, Abrianna’s best friend, finds herself fighting alongside Abrianna and letting go of her own personal restrictions. Although she doesn’t share Abrianna’s zeal for following God’s appointments, Militine knows what it is to be downtrodden. 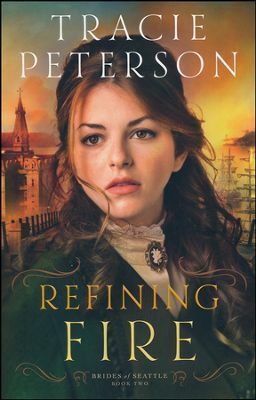 I enjoyed Refining Fire and thought it to be a great story that weaves an attention-grabbing tale with history, romance and suspense. I received this book from Bethany House Publishers in exchange for my honest opinion which I’ve provided here.